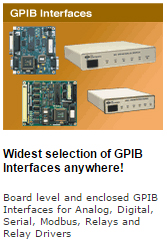 Widest selection of GPIB Interfaces and Products! 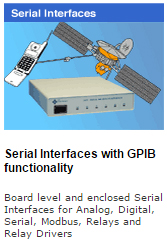 GPIB Bus Interfaces, Extenders, Isolators, GPIB Switch, GPIB Cables and accessories for your system. 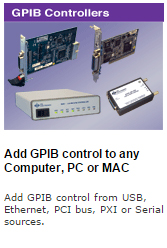 Add GPIB control from USB, Ethernet, PCI bus, PXI or Serial sources. 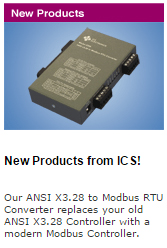 ICS's new 4842B GPIB Bus Switch saves rack space and system cost! Build any size switching or control system. Interfacing and controlling Modbus devices. Modular Switch Control System easily builds all sizes and types of switching and control systems. 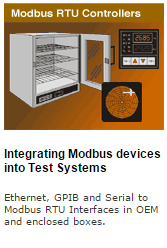 Ethernet, GPIB and Serial to Modbus Interfaces and ANSI to Modbus converters. 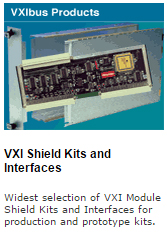 Widest selection of VXI Module Shield Kits and Interfaces for production and prototype kits. 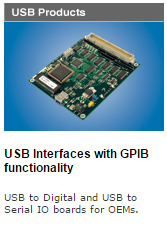 USB to Digital and USB to Serial IO boards for OEMs. ICS Electronics is a leading edge Technology Company creating innovative GPIB, Ethernet, Serial, USB and VXI Bus products for the test, measurement and control industries. For almost 40 years, ICS Electronics has been dedicated to providing our customers with the most ingenious and versatile controllers, interfaces and test modules to automate any test or control system task. Located in Pleasanton, California, ICS Electronics is positioned to meet the needs of our diverse customers and clients. As a privately held corporation, ICS Electronics qualifies as a small business for government procurements. ICS Electronics is recognized as an industry innovator of GPIB Interfaces and GPIB Bus Extension products, Ethernet Gateways and Ethernet Interface products, a well as VXI Module Shield Kits, custom Slot 0 Controllers and VXI Interfaces. 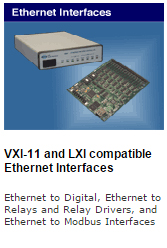 Our Ethernet Interfaces are fully VXI-11 compatible and TCP/IP compatible. ICS provides unmatched customer service and technical support for the life of the product. Our talented and motivated employees are committed to establishing customer loyalty, and approach questions and challenges from a solutions-driven standpoint. We work closely with our clients to best understand their needs and are able to customize the firmware in our standard products to satisfy OEM requirements. Our interface products are manufactured in the United States in an ISO 9001 facility. We sell directly in the United States with technical representatives available to assist in most major US cities. We sell through distributors in Canada, Europe, Asia and South Africa. ICS is continuously improving our products to match our customers' needs. Most ICS products are now RoHS (Restriction of Hazardous Substances Directive) compliant and our enclosed products have CE certificates for resale in the European Economic Community. Our website offers a full product guide with downloadable user- friendly data sheet guides and application notes arranged by interface type to further assist our customers. The philosophy of ICS Electronics is simple and fundamental: the best of controller and interface application systems, technical support and customer service at a competitive price. We are able to accomplish this with our well-trained staff, in addition to the most modern technologically advanced products available in the industry. By fulfilling this simple business strategy, we create long-term business relationships with satisfied clients. To request a quote, ask a question or send us your comments, please contact us at 1-925-416-1000 or use our email contact form available on our website. We are proud of our nationwide scope of services and thankful for your business. We look forward to working with you for your entire interface, test module and controller needs. Last update 7-7--2018 © 2018 ICS Electronics. All rights reserved.